The traffic out of the Eastern Distributor was at a dead halt. It took over 15 minutes to drive from the tollgates at the northern end of the tunnel to where you could see what was going on. At first my attention was concentrated on the flashing orange lights on a large mobile crane. It was driving down from the Art Gallery to the roadway in the opposite direction to the traffic direction. Traffic police were all over the place, putting witches hats on the exit ramp to direct traffic out of the entry to the Domain tunnel and up to the Art Gallery. Vehicles were forced from 3 lanes into two then into one as the road neared the Art Gallery. Traffic could not move at all until the crane moved off the exit ramp. Then the problem became visible. A trailer carrying a big red container was wedged in the entry to the tunnel. The steel barrier beam was sitting on top of the container. Lucky us. At least there was going to be some entertainment while we struggled and crept toward the Art gallery with the prospect of crawling across town to the Harbour Bridge before resuming normal traffic flow. It took so long to drive the 100 metres to the Art Gallery, that by the time I arrived the crane had been set up and was beginning the process of lifting the beam off the top of the container and I had my photo opportunity. 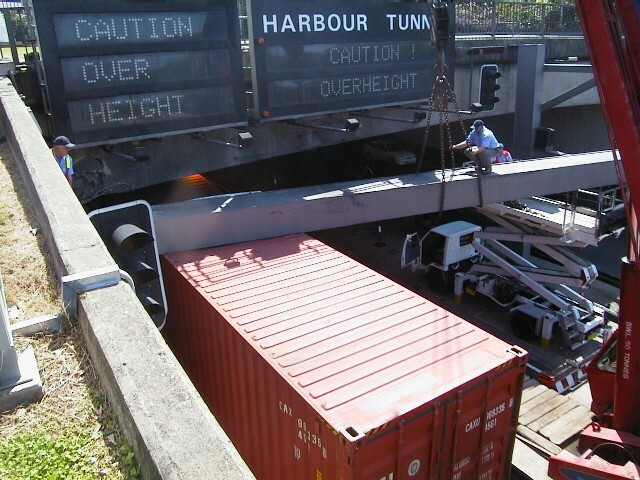 The old poem tells us that for the want of a nail the battle was lost, similarly for the want of 150 mm of clearance traffic was disrupted for over three hours, the container was substantially damaged, the truck looked OK but would have to go in for a thorough check, the city suffered traffic block, and motorists were no doubt frustrated and upset for the rest of the afternoon. Why did the builders of the Domain Tunnel not make the tunnel a little bit higher? It couldn't have cost all that much to make the alteration. Cost in the commercial loss to the city economy, assess the driver frustration, add a bit for the additional pollution to the environment and you can easily justify the cost of a few more millimeters to the tunnel height. And this is not the only time it has happened. Why doesn't the RTA construct another warning device at the end of the Eastern Distributor to measure the truck heights and give an early warning so that any vehicle that is over height can divert up past the Art Gallery and avoid the problems we experienced and save the costs the incident created? The biggest question is "Was the truck driver blind to the signs?" It is easy to miss the warning signs when there are only a few. It is also easy to be complacent about those that exist. I recently received an usual letter pointing out that I had been detected going through a red light at the corner of Carlingford Road and Pennant Hills Road. Sad to say my diary reminded me that I had passed through the intersection on the way to Silverwater on the nominated day. My next claim was that there was no red light camera at the intersection. I sent for copies of the photos so that I could be convinced of the claim validity. A couple of days later I went through the intersection again with a more careful eye and sure enough, there was a camera, a position confirmed by the photos I received a few days later. Even though I have passed through that intersection, on average, 5 times per week over the last six months, I cannot recall having ever seen either the camera or the camera warning sign. God has given us many warning signs to warn of conditions of earth as time and the age draws to an end. Some miss the signs, some have seen them so often that they look and do not see. Some see but become blasé about them. Some are looking at the tragic and unjustified events in New York and questioning God. Having missed the warning notices they ask, "Where were the signposts? Why didn't you tell us this was coming? Where were you? Did you not know this was coming?" Some, disturbed because they think that God has to tell us everything that is going to happen have tried to dig reasons out of ancient writers such as Nostradamus and wrest an application to the event. At the same time there will be national and environmental situations that parallel the personal decline. His trainee workers once asked Jesus, "What will be the sign of your coming and the end of the age?" There would be "wars and rumours of wars," Jesus said, "Nation will rise against nation and kingdom against kingdom. There will be famines and earthquakes in various places". What is going on in the world today can be scary. However, be comforted. Just around the corner is a better world. Jesus said, "Learn this lesson from the fig tree. As soon as its twigs get tender and the leaves come out" summer and fruit is near." (Matthew 24:32-33) Even so, when you see all these things, you know it (The second coming of Jesus and the end of the age) is near, right at the door". A new heaven and a new earth. Keep you eyes peeled for those signs. "Scripture taken from the Holy Bible, New International Version. Copyright 1973, 1978, 1984 International Bible Society. Used by permission of Zondervan Bible Publishers"
This article and the pictures it contains are Copyright © 2004 by John L Morris. Used by permission.